Depart Nairobi in the morning for Lake Naivasha.The Nairobi - Nakuru road is on a contour along the rim of the Rift valley and on viewpoints you will be able to see your whole route for the next days. Your destination is Crater Lake: a lesser lake in the Rift Valley but a place where nature is at its best. On the way we stop at the Limuru Swamp where we do our first bird count: Little Grebe, Yellow-billed and Maccoa Duck, Pelicans, Coots, Egrets and Herons. Soaring are Black Kite, Augur Buzzard and Pied Crow. This afternoon discover the lake shore and take sunset tour of the lake by a local boat to try and spot the various waterfowl and hippo in the area. 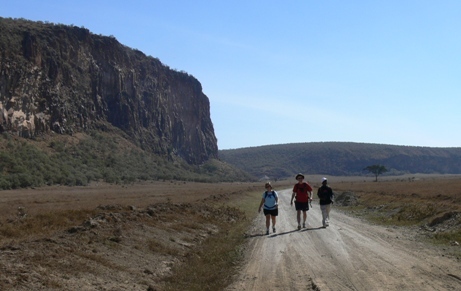 Enjoy the stunning Crater Lake Reserve, some of the only game parks where you are allowed to explore by foot. Dinner and overnight at Lake Naivasha Sopa Lodge. You will start your day with a drive down in to the Great Rift Valley past the spectacular Volcano Mount Longonot and head towards the rolling plains of the Masai Mara. Before entering into the Game Reserve, you will take a visit to a Masai village. Enjoy learning about Masai tradition and lifestyle, and you can also try your hand at the age-old tradition of bartering for souvenirs. The village is slightly commercialised but still gives a good idea of how the Masai live. Dinner and overnight at Mara Sopa Lodge. You will spend a full day in Masai land, home to one of the most fascinating cultures in Africa. In the vast grasslands, expect to see Elephants; the large Cats - Lion, Leopard, and Cheetah; the herd animals - Zebra, Wildebeest, Thompson's and Grant's Gazelles; and specialties like the Hartebeest and the Topi. All meals and overnight at a lodge. After breakfast depart for Nairobi to catch your flight back home.